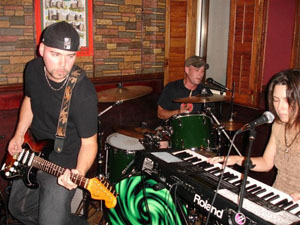 AFTER PLAYING IN BANDS FOR SEVERAL YEARS, MEMBERS FROM TEMPERED STEELE & SAGE STARTED JAMMING AS A THREE PIECE JUST FOR FUN IN 2005. IT SOON BECAME APPARENT THAT THE FOCUS OF THIS NEW OUTFIT WAS GOING TO DEVELOP INTO SOMETHING SPECIAL. DRAWING FROM A WIDE RANGE OF INFLUENCES THEY STARTED TO MIX ROCK , FUNK, REGGIE AND A LITTLE JAZZ TO CREATE A VERY ORIGINAL SOUND THAT WAS ALL BY ITSELF WHEN IT CAME TO COMPARING IT WITH OTHER BANDS. THE RESULT BECAME KNOW AS TRISCALE, A THREE PIECE THAT PACKS A HUGE SOUND THAT IS UNLIKE ANYTHING ELSE OUT THERE TODAY. WITH A TON OF EXPERIENCE UNDER THEIR BELTS AND A SHARED LOVE FOR PLAYING LIVE, THIS BAND IS SETTING OUT TO TAKE ON ALL THAT COMES IT'S WAY. Review: Triscale is a rock-solid juggernaut of blues-based rock music. With only 3 pieces, the "all killer, no filler" mantra is even more amazing because NOTHING IS MISSING. Their sound is full and their performances flawless. Great original songs offset by well chosen covers make for a versatile sound that is sure to please the patrons of nearly any venue in the area. Catch the vibe and catch the band. You wont regret a thing except not catching em sooner.